Why? Because leaders don’t get to be leaders without a degree of risk-taking, and Girl Scouts are encouraged to take risks. This is critical given that research also shows that girls, in general, are less likely to take risks than boys. This is particularly important to note now, as the Boy Scouts starts its first year accepting females into its programs. When Doug Sundheim, author of Taking Smart Risks: How Sharp Leaders Win When Stakes are High, was about to submit his final manuscript, he was stunned after a female employee pointed out that only 18 percent of the stories in his book involved women. He wrote about his discovery in “Do Women Take as Many Risks as Men?” published in 2013 in the Harvard Business Review, noting that while 51 percent of the network he mined for stories was female, only 36 percent of the stories about risk he received in return featured women. He also found that women are less likely to get support for taking risks simply because people perceive them to be more risk-averse than men. Dr. JoAnn Deak, an educator, psychologist and author of How Girls Thrive, says females are wired to take fewer risks than males, a phenomenon leftover from when Neanderthals hunted saber-toothed tigers. But that poses a problem. In a recent keynote address to nationwide Girl Scout leaders, she talked about how risk-taking has the highest correlation with success and happiness in life. “If you let your neurobiology … take control of you, you’re not going to be as happy and successful in life. You must go against it when something bothers you — like standing up on a stage. Do it anyhow!” But girls aren’t exactly socialized to be risk-takers, either. At the Girl Scouts, we aim to create a space for girls to take risks and realize their full potential. A primary goal of Girl Scouts is to foster the next generation of female business leaders and entrepreneurs. Today, Girl Scouts has four core program areas that form the foundation of what we call the Girl Scout Leadership Experience: STEM, outdoor adventure, life skills and entrepreneurship. Developing these leaders has been at the heart of Girl Scouts since its founding in 1912 — eight years before the 19th Amendment to the U.S. Constitution granted American women the right to vote. We believe in the power of a single-gender organization to accomplish this purpose, as empirical and anecdotal evidence proves this approach most effective. Girl Scout alumnae rank higher than non-members in key indicators of well-being, including sense of self, educational attainment and civic engagement. With the Boy Scouts decision to start accepting girls in 2018, some question the need for an all-girl program. They shouldn’t. 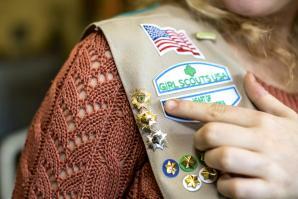 Allowing girls to join Boy Scouts is not about gender equity. Girl Scouts isn’t Boys Scouts for girls; Boy Scouts isn’t Girl Scouts for boys. While elements of the programs overlap — for example, both mark achievements by issuing badges — we are two distinct and different organizations. While we can agree it’s important for boys and girls to learn to respect one another and work together, it’s critical that both boys and girls have a single-gender space in which to develop. Studies from the Girl Scout Research Institute found girls to be more likely to speak openly and honestly in an all-girl space. Girls report they are more authentic and are more apt to take risks when it is “just girls.” As a result, girl-only programs, designed specifically for them, tend to be dynamic and full of ideas and conversations. Girls value girl-only “safe spaces” where they can confide in trusting adults and other girls. They feel free to talk about issues they wouldn’t necessarily talk about with boys, try out new activities without a fear of failure and experience less pressure to look or act a certain way. Most girls spend their formative years in a multi-gender environment. Giving girls the opportunity to experience a single-gender environment can do wonders, helping them to develop the courage, confidence and character they need to get through life. My Girl Scout experience, which began at age seven, allowed me the opportunity to problem-solve under the guidance of a troop leader but in an environment that was very much troop-led. When I cut my foot on a hike through a stream during a camping trip, we were miles from civilization. The girls in my troop carried me back to base camp and made me comfortable while I waited for a ride to the doctor. Thinking back on that day, I don’t remember the involvement of my troop leader — who was my mom. I remember my troop members — girls my own age — jumping into action and taking care of me. How would this have gone if boys were hiking with us? Would the girls have sprung into action with the same enthusiasm? Would they have deferred to the boys? I’ll never know. What I do know is that Girl Scouts gives every girl the chance to see what she would do. The intrinsic leadership development component of the Girl Scout experience cannot be replicated in a multi-gender environment. Girl Scouts provides the necessary support so girls can be free to take risks, in a safe environment with caring female role models and mentors. 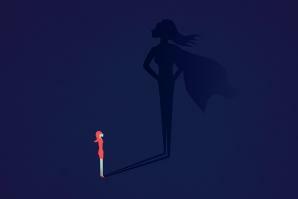 Taking risks not only changes girls, but also acts as the catalyst for girls to become the unstoppable women leaders of tomorrow our world so sorely needs. This is a well written, fair minded article. For that I am very grateful. However, as a leader in both Girl Scouts of the USA and Boy Scouts of America, I must comment that the phrase "caring female role models and mentors" is overly-simplistic. In our Girl Scout troop, I am grateful to have one of our girl's fathers as one of my assistant leaders. His conscientious presence and supportive work enables our leadership team to reinforce that a true team of men and women work together respectfully to achieve shared goals. We all come to the table with unique skills sets but cooperation enables us to leverage the combined skills to achieve more than is possible alone. No volunteer organization that teaches leadership can afford to ignore 50% of its instructional base. Both organizations have recognized that. Both organizations serve their purposes--related ideals, implemented in different ways. Today's society needs to educate our youth to lead by example and make the better the world a better place. This is why we are scouts! Hummm, interesting. I understand the need to incoirage girls and form them into strong, independent women. My daughter is a girl scout. I am the co-leader. Our girls would encourage and welcome boys to join their goup. Especially those boys who may not feel safe with other bius die to gender identity or sexual orentation. These are the young people that need feel welcome and safe. Why are we excluding them? My daughter is an Ally to the LGBTQ family at the age of 6 - she gets it- it appears the boys scouts get it - its just a matter of time before the girl scouts will have to get it, if they want to stay relevant.